Our range offers a secure high quality perimeter fencing solution for your business or home premises. Steel railing security fencing provides a strong and aesthetically pleasing perimeter security fence suitable for most requirements. Efficient manufacturing processes ensure that this type of security fencing is both long lasting and affordable. Steel railing security fencing can surround factories, fields, car parks etc. it will not sag over time. 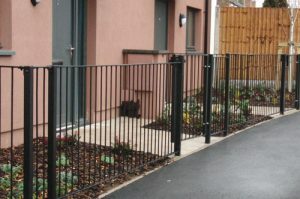 We have many satisfied customers for our steel gate fences in Staffordshire, Derby, and Nottingham.